This isn't at all what I was expecting to bake this past weekend. I had plenty of ideas but hadn't accounted for my extreme laziness come Saturday afternoon. With nearly zero food in my house, including baking supplies, I managed to convince myself to not go to the grocery store. I still felt like baking, only now it needed to be something that required only the most basic of ingredients. What's so wonderful about biscotti (to me) is how simple the ingredients are (or should be), making it the perfect recipe for not only my weekend situation but any situation. I don't need or want my biscotti fancy. I just want the cookie. I don't add chocolate chips, or nuts, or dried fruit, or whatever. I suppose I'm this way about a lot of things, but it is especially true with biscotti. I have four versions here and all of them focus on only one flavour. I have also previously mentioned how I much prefer the teeth shattering, jaw destroying Italian-style biscotti to its Americanized counterpart, where fats are added that soften the cookie. If the biscotti can't hold up to a hot cup of coffee it ain't for me :). To my disappointment I couldn't find one chocolate biscotti that didn't have added butter or oil. So I decided to adapt my vanilla biscotti recipe to chocolate. 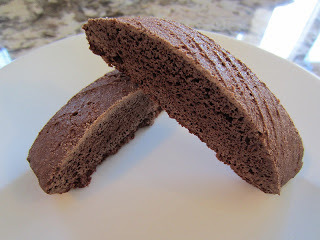 To alter the recipe I did nothing more than reduce the flour by a half-cup and add back an equal amount of cocoa powder. Combined with a small change to the amount of vanilla and I was done. It couldn't be easier. And it baked up perfectly. However, before I get to the flavour let me warn you, if you have any dental problems make sure to have milk or coffee handy for dunking. These biscotti are unforgiving. Imagine the image of a cartoon character's teeth shattering and you have a good idea of what to expect. I actually had to warn my mother before she tried one. It's everything I wanted it to be :). And when it comes to flavour this is a fantastic chocolate cookie. Rich with chocolate flavour, perfect sweetness, there's nothing more to say than that. I wouldn't change a thing. 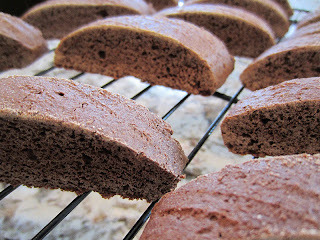 These biscotti are terrific and the flavours shine even brighter when paired with a good cup of coffee. Dunk, swirl, let sit for a few seconds, remove and bite. Chocolate and coffee, the only thing better is never having to worry about spooning soggy cookie from the bottom of your cup. In a large bowl add flour, cocoa powder, baking powder, baking soda, salt and whisk to combine. Bring dough together and with slightly wet hands lightly knead dough 7 to 8 times in the bowl. Place dough on prepared cookie sheet and shape into a long rectangle about 15” x 3” in size, and keeping the thickness as even as possible. -- At this point, my Grandmother suggests that you scratch the top of the dough with a fork to give it that rustic "homemade look" :). And I don't mess with Grandma :). Remove from oven and allow to cool on cookie sheet for 2 minutes. Place cookie log on rack to cool for 5 minutes. With a sharp serrated knife, cut cookies approximately 3/4 inches apart (on a bias if you choose). Place each cookie upright on cookie sheet, roughly 1 inch apart.